Last week I asked what was in the box. On Friday I bit the bullet and started what was in the box. 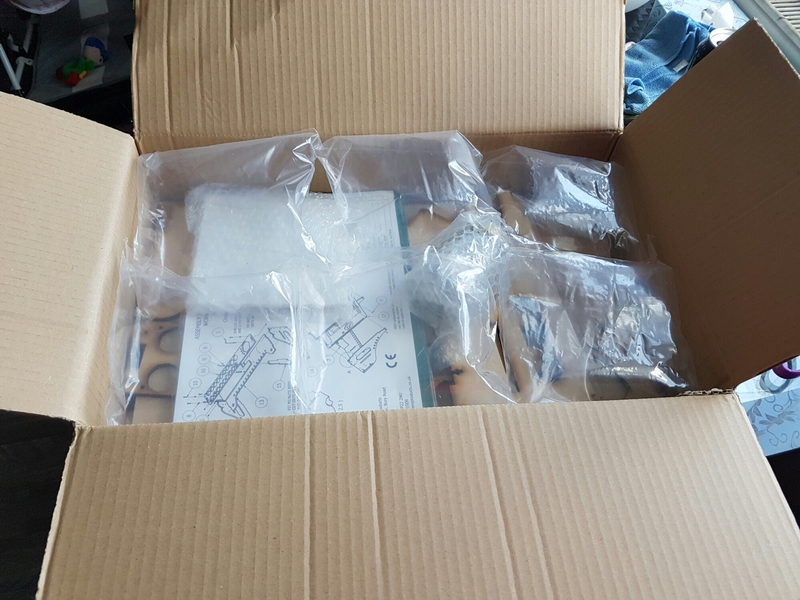 Now the box comes from a company called Sphere Products based out of Diss so not a million miles away from me, but somehow had never seen or heard of them, sorry you wanted to know what was in the box. This is about 3/4s of the way through so can you guess what it is yet? That’s it a painting station there are some bits missing from the above photo, but let’s discuss why I decided to go for this painting station, well for a start the ‘shop pictures looked good, secondly it has cut outs so you can transport it around, admittedly when fully loaded it’s a bit back heavy but that was to be expected and finally I am so unorganised it’s unbelievable, and this is the start of me getting a system in place. The tile and wooden L piece come off to reveal a cutting mat so easy to build on as well as painting so ticks two boxes there really. 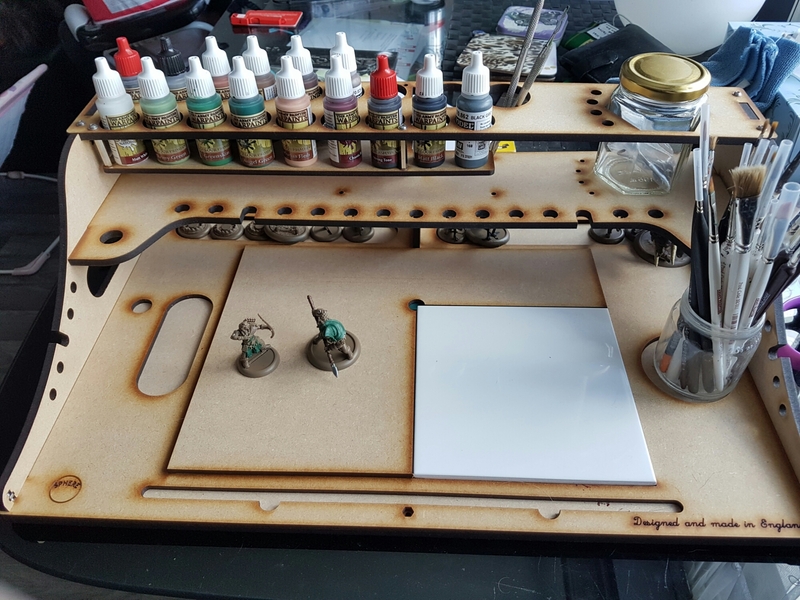 Some good things about the paint station, it’s easily assembled and once up is quite sturdy as well, and there is plenty off room to place bits ‘out of the way’ whilst drying and or assembling. When assembled it also has 6 nicely located rubber feet, so if your dining table is made of glass (as mine is) there will be no irate significant other moaning about scratches, other than the ones caused before you got this. Whilst it would be nice to have some more space for paints, it would cut into the space I just mentioned which can take a fair sized miniature, so on that front it’s really six of one half a dozen of the other, and that is its only real problem other than when moving it can be a bit back heavy, but short off a lump of iron or anti-grav plates you aren’t going to get round that. Finally the work area could have been a bit bigger I feel, but that could be my natural ability to spread out and take over an entire 4×5 foot dining table talking. 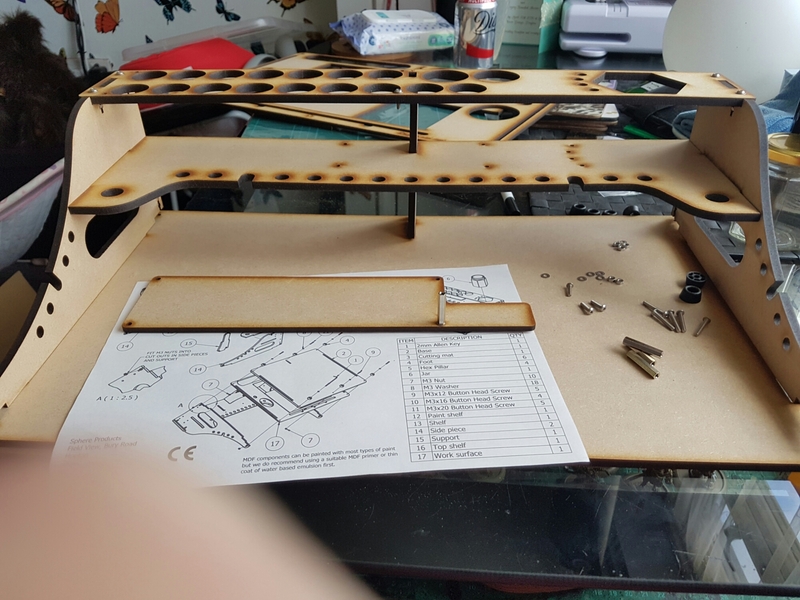 All in it is an easy and quick to build kit that is sturdy and despite a few ‘personal’ issues with it, excellently designed piece of kit. Would I recommend it, yes I would, because despite my quirky personality flaws I think it is going to help speed my painting up and help keep some momentum going with my painting.